Does mAh measure how long a battery would last? 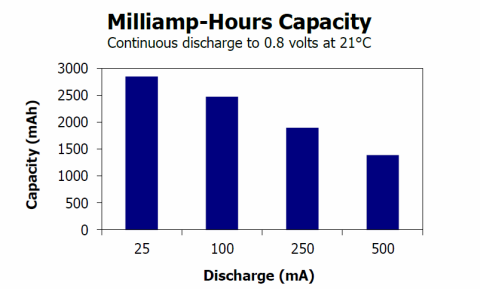 I know mAh tells how much milliamperes a battery can deliver in an hour. But does that also tell how many hours the battery would last? Sorry but I don't really get it. If we're talking about a water tank, to my impression, mAh is like how big the faucet is and not how much water there is in the tank. I'm really confused as to why we measure battery capacity in mAh if my understanding about it is correct. mAh (or mA·h) is not how many milliamperes a battery can deliver in an hour. That would be mA/h. Current, measured in amperes, is already a rate of stuff. Specially, one ampere is one coulomb per second. So, if current is like speed, then mA/h is like acceleration, and mAh is like distance. Rather, mAh it is a unit of charge. It is what you get when you multiply current by time. By multiplying by time, the "per time" part of the ampere is cancelled, and you get back to charge. For example, if you draw 1 mA for 1 hour from a battery, you have used 1 mA · 1 h = 1 mAh of charge. If you draw 2 mA for 5 hours, you have used 2 mA · 5 h = 10 mAh. The charge capacity (the number measured in mAh) is determined by measuring how much charge can be removed from the battery before voltage drops to some arbitrarily selected level where the battery is considered "discharged". This may or may not be the threshold at which your circuit no longer functions. Battery manufacturers, wanting to make their batteries seem as good as possible, typically select a very low threshold voltage. Assuming you are considering charge available only down to some voltage threshold, the actual charge available from the battery depends on temperature, and the rate at which you discharge it. Lower temperatures slow the chemical reaction in the battery, making it harder to extract charge. Higher rates of discharge increase losses in the battery, decreasing the voltage, thus hitting the "discharged" voltage threshold limit sooner. The electric potential difference provided by the chemicals in the battery is actually constant; what makes the voltage decrease is the depletion of the chemicals around the electrodes and degradation of the electrodes and electrolyte. This is why battery voltage can recover after a period without use. So, the point at which the threshold voltage is reached can actually be quite complex to determine. If you can find a good datasheet for your battery, it may give some insight into the parameters under which these calculations were made. Be aware that batteries (cells, really) have a nonlinear depletion characteristic. Even though milliamp-hours is a finite amount of charge, you must realize that not all of it will be usable by a given load at a given voltage, and that the value given by the manufacturer is generally for the case where the cell is powering something with low current demands. In that situation, you get almost all of the available energy. However when you power something that requires more current, you won't actually get the full capacity. Technical edit, per Phil's comments: By saying "...you won't actually get the full capacity." I mean "You won't actually get the full capacity given the same load which requires a certain voltage to operate." The cell's voltage will drop and become insufficient for the load, at which point the charge is still in the cell, but it's not necessarily usable. If you continually power a device with 25 mA, the cell will have approximately 2750 mAh. If you divide this current into the capacity, 2750/25, you get the number of hours that the battery can sustain it: 110. If the load is 500mA, the cell's usable capacity actually drops to approximately 1500 mAh, and 1500/500 is only 3 hours. Devices like remote controls do not use continuous power. They spend most of their time in an idle or "sleep" state, and consume power only when you press a button. In those cases, cells will continue to be viable and power the device for a very long time. The milliamp-hour capacity chart is based on usage, not on idle time. Environmental effects and physics will erode the chemistry in a cell even when it isn't being used. The datasheet assumes you are working with fresh cells and within certain environmental conditions. As a very rough guide it will give you a ball park figure for current/timing. So a 100mAh capacity battery would be expected to give 10hr @ 10mA or 1Hr at 100mA. In reality you get less. This will depend on the battery type, its age, condition, temperature etc. Then my rating for being able to sustain a speed of 10km/hr for one hour would be 10GH (Gonzales Hours). Not the answer you're looking for? Browse other questions tagged batteries or ask your own question. Why are deep cycle batteries rated in amp hours instead of watts hours? Why do dead batteries appear to recharge on their own after awhile? For high resistance load, Battery lasts longer? Why do electrons in battery not “go out” if there is no resistor in circuit? Building a large lead acid battery? How to measure Li-Po battery leakage? How are these AA batteries 4500 mAh? How long will my battery last under this load and with this source? how does a device running on a lithium battery measure the amount of energy left? whats better? 20,000 mAh 5V Battery or 9Ah 18v battery to use as portable power charger?